Interior painting ideas - Northampton MA Realtors | Maple and Main Realty Agents explains when and how this remedy would apply. Painting over wallpaper is acceptable if removal will damage the wall or the wall is already damaged. While painting over wallpaper isn't the best option, sometimes it's the only option. Forget what you've heard: It's possible to paint over all wallpaper -- and not just the paintable type. While it's always preferable to remove wallpaper before painting, it's not always possible. Sometimes, you'll find layer upon layer of wallpaper, or removal will cause significant wall damage, says Jeff Sellers, owner of Merrifield Paint and Design of Arlington, Virginia. "In some of these older homes, when you start pulling paper off you really don't know what you're getting into," Sellers says. "You can get the paper off and find the wall is damaged, and that's why they put the wallpaper up. You never know why people put up wallpaper." Sellers says the type of wallpaper is a good indicator of whether it will come off easily. Paper-backed wallpaper is more difficult to remove than vinyl. You'll likely need to use a scoring device and adhesive remover, which may prove laborious and result in possible wall damage. 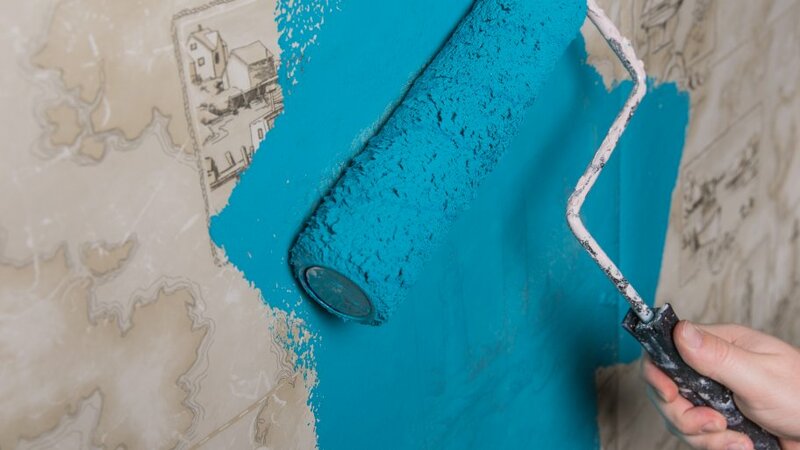 You may be tempted to slap some paint on the wall, but there's more to it. Without proper preparation, the wallpaper will eventually lift and begin to show through the paint -- and look like painted over wallpaper. According to experts, the wall should be clean and dust free. Remove all loose ends. If unable to remove, glue or cut away, spot prime and fill holes with spackle. Prime the wallpaper with an oil-based primer and skim the wallpaper with drywall mud to cover seams from the wallpaper and create a smooth wall. After skimming, sand the wall and prime again. Be sure the wall is dust free before applying paint. "What matters is that you use an oil-based primer to seal the wallpaper," says Carlos Mendoza of Carlos Mendoza Painting, in Spring, Texas. "That's what's going to seal the wallpaper." Once you've prepped the wall, Mendoza recommends using satin finish paint instead of flat, which is porous. If you prefer, you can use flat paint. However, because it's porous, flat paint holds dirt and is difficult to clean. "The satin finish does show imperfections, but as long as you keep the texture consistent, you should be OK," Mendoza says. Avoid bubbling, lifting or other issues with the wallpaper by testing a couple of spots and allowing to dry completely before painting the entire wall, said Octave Villar, manager of Behr application laboratory in Santa Ana, California. When we pulled up the old linoleum kitchen floor in our last house in Northampton - we were excited to see fir floors beneath, just waiting to be brought back to life. I had my heart set on red floors - somewhere between the color of cherries and blood. I went to many paint and hardware stores in the Pioneer Valley to look for the right color stain, but all I could find were barn reds, mahogany reds and auburns. I consulted woodworker friends and was pointed in the direction of aniline dyes. I purchased red and black dye from a local woodworking store, and then set about mixing up just the right hue before staining our floors. I won't go into the gory details, it was a messy process with a lot of room for human error. I did wind up with the perfect color red stain, which also allowed the wood grain to show through. I have always been a fan of painted wood floors. The right paint job on a floor can give a room so much personality, as well as a fresh new look - without spending a great deal of money. Whether you are interested in creating a pattern on the floor, adding a pop of color, or going with a lighter neutral, a painted floor can be a wonderful way to change up the look of your space. The following article from the Associated Press provides food for thought about how to go about painting a hardwood floor. One alternative that's gaining popularity: painting older hardwood floors. You can add solid color, stripes, or any imaginable stenciled or hand-drawn patterns to a floor. There's actually a long tradition of painted wooden floors in American homes, says Tom Silva, general contractor on the long-running PBS television series "This Old House." One hundred years ago, paint was considered a practical way to protect floors and add some beauty in the process. In a survey done this month of more than 1,200 users on the home-improvement website Houzz.com, 15 percent said they're ready to make the leap to painting while 85 percent were still more comfortable with stained wood floors. But Houzz editor Sheila Schmitz says some of the site's members who have embraced painted floors have done so with real creativity. "We've seen homeowners reinvent their floors with glossy white paint, oversize stripes, checkerboards with alternating natural and painted finishes, and even more fanciful shapes," Schmitz says. It's a DIY project that requires effort but little experience. So how do you do it, and what are some of the boldest, most interesting approaches you can take? Fans of painted floors point out that the process is less labor-intensive than staining because you don't have to sand away every old scratch or stain. But that doesn't mean you can skip the step of prepping your floors. Clean the floor well, says Silva, then scuff it with sandpaper just enough to create a slightly rough surface. That prep work is the key to making sure the first layer of paint or primer will adhere. Primer isn't required if the floor already has some finish on it. But putting down a few thin, clear coats of primer can make it easier if you decide years from now to remove the paint. If you do prime the floor, use sandpaper to lightly scuff that clear coat after it dries to help subsequent painted coats adhere well. Interior designer Camila Pavone was ahead of the trend in painting her kitchen floor in 2010. The room previously had green walls and a stained wood floor. 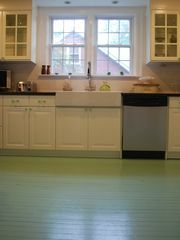 Pavone switched the walls to a creamy white (she used Martha Stewart's "Glass of Milk") and covered the wood floor with jade green paint. She considered using marine paint but chose a formula called Break-Through!, which dries quickly and creates a harder surface than many other types of paint. Five years later, Pavone is still thrilled with the result. The floors "always get a 'Wow' when new people come to my house," she says. "The only thing I didn't take into account was the wear and tear of two dogs and now two kids. The claws on the dogs do scratch the floors up a bit. But I try to pretend that if I saw that in a store display in Anthropologie, I would think it was fabulous. So I don't stress." Because the kitchen is a high-traffic area, Pavone has repainted the floors once every two years to keep them looking shiny and scratch-free. But that work is relatively easy. "It's a really fast project and normally only takes around two hours," she says. "I would totally do it again!" 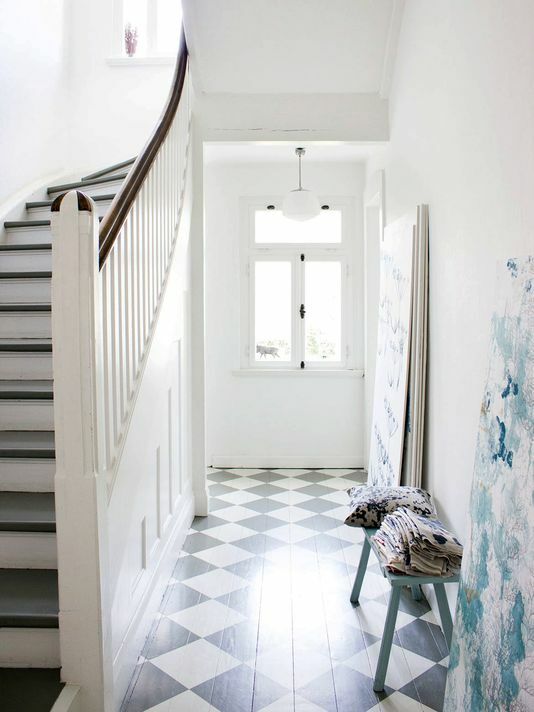 Paint can also be perfect for entryways. Thick stripes, diamond or chevron patterns can make a small foyer seem bigger, drawing attention to an otherwise ignored space. Once the floor is cleaned and prepared, simply lay out your design with painters' tape. Be careful to measure the width of stripes or the angles of diamonds or chevrons to make sure you've laid the tape in the proper places. Consider using large stencils to add a pattern to the floor of a larger space, like an enclosed porch. Or paint a brightly colored "rug" in the center of a room by first painting a solid rectangle, then adding a pattern once that solid coat is completely dry. Another option: Coat the floor with a semi-transparent stain or paint that allows the grain of the wood to show through. Once it's dry, use painters' tape to create a border around the room that you'll fill with a contrasting or complementary color or pattern. Once you've finished your painted masterpiece, add one or several clear coats on top for protection. Patience between layers is the key: You may be tempted to paint again as soon as one thin coat feels dry to the touch, but you'll get a much stronger and more attractive result if you leave extra time. Silva points out that oil-based topcoats "may add a little bit of a goldish color to it, because of the oil. Water-based will give you the true color of the paint." And, obvious as it may sound, remember: "Know where to start and where to end," says Schmitz, "so you don't literally paint yourself into a corner."